Ever since Adidas took over as the kit supplier for the FIR back in 2012, the German sportswear firm has been on a ridiculous hot streak, with each new design being covetously regarded by fans the world over for their elegance and style. But a World Cup, as we’ve said a lot recently, is the big leagues. Rugby’s showpiece event puts the shirts produced in front of more pairs of eyes than in any other tournament, and nobody wants to be the one who made the dreadful shirt that everyone remembers for all the wrong reasons. Nobody wants to be Canada in 1995. As a result, you often see teams and suppliers keeping it clean with their World Cup designs – after all, nobody is going to throw their toys out about a plain, classic-looking design, are they? Of course, while keeping it clean is unlikely to get your design remembered for all the wrong reasons, it’s not likely to be remembered for many right ones if you play things too safe. Which brings us to the new Italy World Cup home shirt, which we honestly think is on the verge of being too plain to really be memorable or exciting. 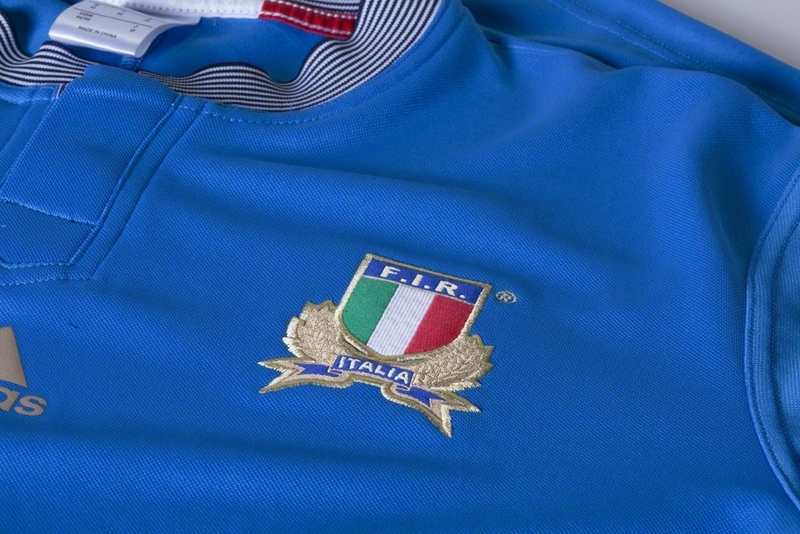 While a few elements of recent Italy shirts have been retained, such as the coordinated gold badge trim and sponsor logo, many of the new developments we did really like have been discarded. 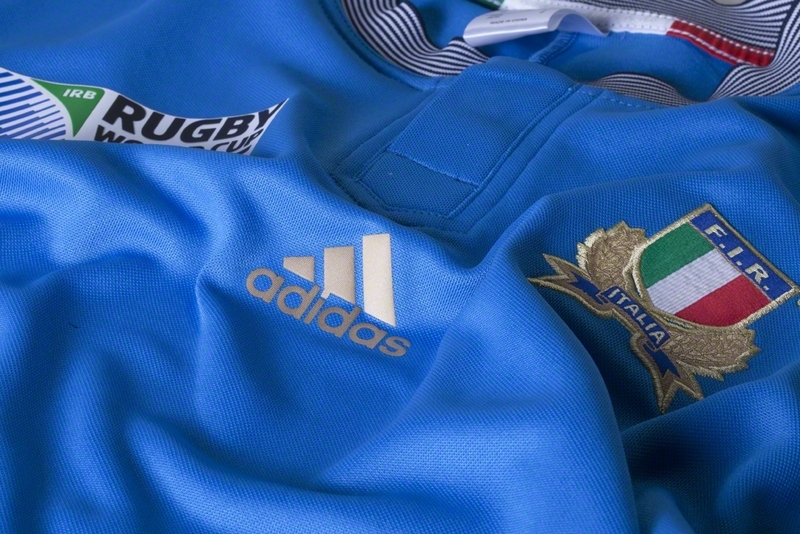 Gone is the emphasis on dark blue as the secondary colour – we loved the way last year’s Six Nations gear brought in this instead of white to make Italy look and feel a bit different. Gone too is another little touch that’s been a constant on Italy shirts of the Adidas era – clever, subtle use of the colours of the Italian flag in the trim somewhere. 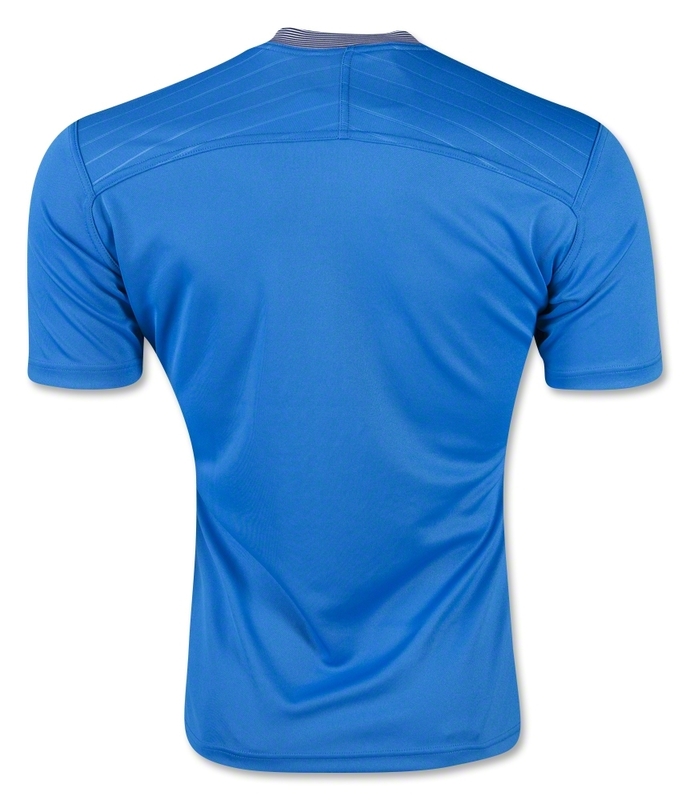 Instead, we have a very plain, inoffensive blue shirt, with the only real ornamentation being a blue and white stripes collar. Honestly we’re not entirely sure what the thinking behind this, besides bringing a touch of nautical charm to proceedings. It just doesn’t seem to go… it looks like someone’s stitched the wrong collar on instead of something that fits in better with the shirt’s more classic, simple vibe. Adidas’ strike rate with Italy shirts couldn’t last forever – eventually law of averages dictates they were going to stumble a little, but it’s a shame they chose the worst time to do so. That’s not to say this is an ugly shirt – it’s not, and we quite like it in some respects. However compared to the beautiful shirts that have gone before, this feels a bit of a let down. It had to happen sometime! about this Italy R.W.C 2015 home jersey any more than I do. a disgrace to the All Blacks name. elegance, panache every thing that is synonyms with Italian fashion houses. This review is a bit rough… yes it’s overly simple, but for national jerseys that’s not a bad thing in my view. 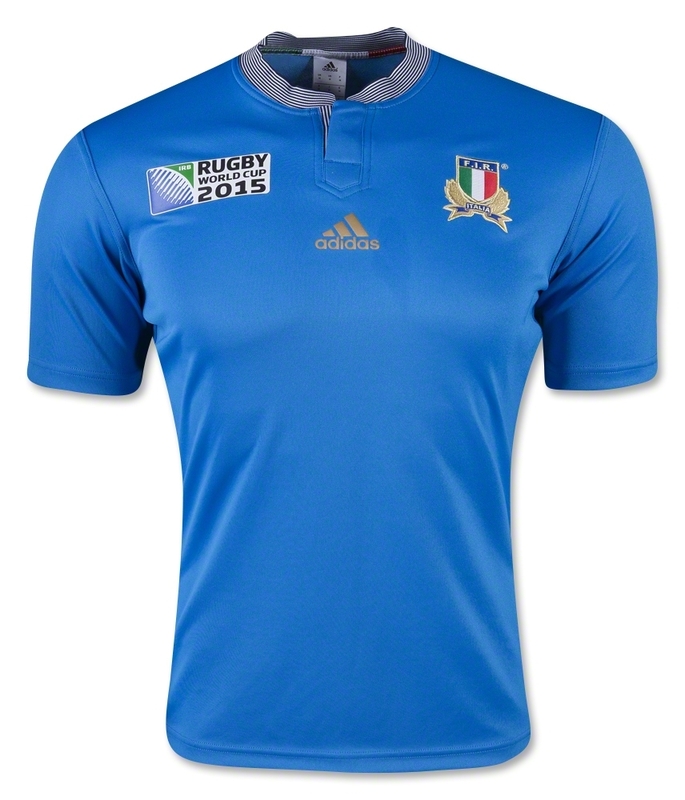 This jersey goes back to basics for the Italians, but the collar gives it a nice point of difference without being ugly and over-done like say the stripey turd that Asics laid over the Wallabies jersey shoulder. If we could get a jersey like this for Australia in gold with a green collar we’d all buy them in seconds.